Oscar Sunday @the Tilly! 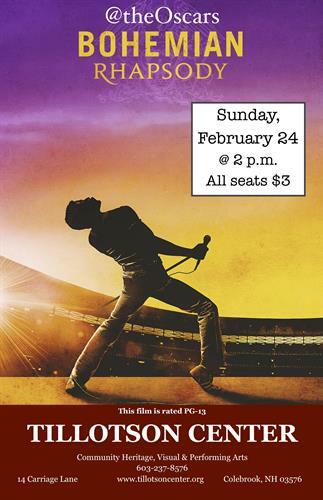 'Bohemian Rhapsody is a foot-stomping celebration of Queen, their music and their extraordinary lead singer Freddie Mercury. Freddie defied stereotypes and shattered convention to become one of the most beloved entertainers on the planet.' This film is rated PG-13. Sunday, February 24, 2019 / 2 p.m.